It’s Time to Redeem Your Macy’s Money! 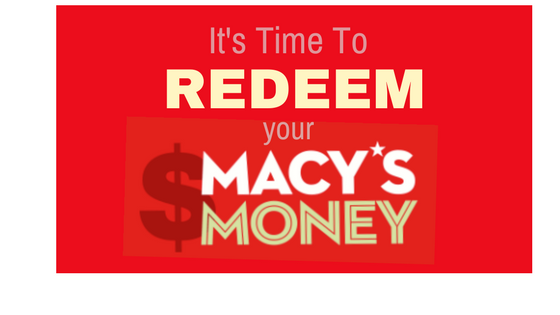 You’ve worked hard and now the time has come: it’s time to redeem your Macy’s Money! That’s right, some of you earned a total of $200 of Macy’s Money simply by shopping and saving like you always do at Macy’s and Macys.com. But don’t sit on those earnings for too long because you only have until June 6 to redeem your Macy’s Money. Remember, even if you shopped online and received your Macy’s Money code through email, you can still use it in stores; just print out the email and bring it with you! The best part is that you can even use your Macy’s Money on top of coupons and sales, making it stretch even further. For example, the Macy’s Summer Sale is going on right now, where you’ll earn an extra 20% off your purchase with the code SUMMER. Your discount is taken before paying, which means savings galore! The only wrong thing to do with your Macy’s Money is not to do anything at all. So what are you waiting for? Stop reading this and start shopping now!